grave – A quirky yet practical look at the inevitable. Searching for gold, laid to rest under tin: a prospecting history captured in WA’s remote Menzies cemetery. Mining accidents, typhoid, suicide, exhaustion, burns, starvation, childbirth, diarrhea, and dysentery are just some of the causes of death of those who moved to the Goldfields of Western Australia for a new, wealthier life. Menzies is a small town 130km north of Kalgoorlie and 730km north east of Perth. Poor sanitation led to a deadly outbreak of Typhoid in 1895. Twenty-eight of the 42 known burials at the Menzies cemetery in 1896 were typhoid victims. Between 1895 and 1905, at least 105 people buried at Menzies are thought to have died from typhoid. Most victims were men aged 20-40 years old. Men aged between 20 and 40 were the most prominent typhoid victims at Menzies cemetery. Twenty-eight of the 42 known burials at the Menzies cemetery in 1896 were typhoid victims. In all my cemetery travels I’ve never seen so many tin and iron headstones as I have at the Menzies cemetery. Trinkets, photos and crosses would be been housed behind glass in the headstones which were a much cheaper option than the traditional headstones. Many were home-made from the only materials available nearby, including kerosene tins. Tin headstones housed trinkets, crosses and wreaths. There are no graves with the glass still entirely in tact in Menzies cemetery. The tin and the wreaths have survived the last 90 years; the glass not so much. There are only a few iron memorial headstones at Menzies cemetery. This is something I’ve only seen in the WA Goldfields. If you know of any others I’d be keen to hear from you. Here, this home-made memorial looks like it was made using a bed frame and a kerosene can. Wreaths would have been housed behind the glass of this tin headstone at Menzies cemetery. John Cunningham’s “sorrowing wife” would have erected a tin headstone before a marble one was made, often years later. Not uncommon in Australia’s bush cemeteries is the use of rocks around unmarked graves, identified only by iron plot markers. Rocks and an old enamel pannikin mug mark grave 20 at Menzies. An unmarked grave surrounded by iron at Menzies cemetery. According to the information sign at the cemetery, the mortality rate from typhoid fever in the Goldfields was many times higher than any other place in Australia, while alcohol abuse, poor diet, and dust from mining operations contributed to lots of other illnesses. Looking for gold in one of the country’s harshest and driest regions was incredibly tough. Sadly there was also a high suicide rate. Prospector Peter Bremner suicided in 1902. The signage and information for visitors to the Menzies cemetery embraces a journey back in time. Rich in history and well-researched, the red dirt cemeteries of the Goldfields are nestled in woodlands and are part of a fantastic tourist trail in the region called the Golden Quest Discovery Trail. The once bustling mining towns are long gone, but their cemeteries remain, giving travellers like myself an insight into what it was like to live and die in the search for gold. ABOUT THE BLOGGER: Lisa Herbert is a cemetery wanderer, journalist and author of The Bottom Drawer Book: an after death action plan, an informative and amusing workbook and funeral planning guide for those who want to prepare for the inevitable. The second edition is available in Australia for $18.95, including postage. You can buy here. Cemetery tales: typhoid and death by beer barrel. There are few cemeteries that don’t have a typhoid story to tell. Typhoid fever is a contagious bacterial infection that can be controlled by vaccination, but it was a different story in years gone by. (Tens of millions of people have died from this disease and thousands continue to do so, particularly in developing countries). Still holidaying, I came across this grave in the South Island town of Cromwell on my usual cemetery wanderings. Four Scally children died within one month from typhoid in 1874. They were 7, 6, 5 and 3. One year later, their mother Ellen and sibling Margaret (almost a year old) died from the same disease. Ellen was 29. Four Scally children died of typhoid in one month. Their mother and sibling died of typhoid a year later. There are other historic graves telling a similar story of pioneering hardship in the cemetery. Below is a photo of the Goodger family grave. The Goodger family grave. Patriarch George drowned, aged 53. His son Henry (14) and daughter Mary Anne (12) died from typhoid three years earlier, on the same day. Cromwell’s first cemetery was founded in 1865 and, like many cemeteries, contains unmarked pauper graves. Many Australian cemeteries in rural and regional areas have at least one of these graves pictured below, referring to a horse accident. It seems New Zealand is the same. John Garrett was killed aged 32 by “the fall of his horse”. However one cause of death I have never seen before on my cemetery wanderings lies on the gravestone of 26 year old Joel Chapman. He was killed by a landslip in 1875. The cemetery records show there are several men buried in this cemetery that were killed by “fall of earth”. Landslips and rock falls remain a daily event in New Zealand. These days though authorities are better at monitoring and predicting them. Joel Chapman was killed in a landslip in 1875. He is one of several men killed “by a fall of earth” to be laid to rest in the Cromwell cemetery. And so the Litany Street cemetery in the small South Island town of Cromwell, like all other historic cemeteries, provides an insight into the difficulties of pioneering life. Other causes of death of people in this cemetery, as listed by some great work by the Dunedin Group of the New Zealand Society of Genealogists and members of the Cromwell Family History Society, include: appendicitis, teething, whooping cough, childbirth (there are many of these), dropsy, pleurisy, cancer (just one), pneumonia, congestion of the lungs, dysentery, exposure, bronchitis, diarrhoea, tuberculosis (just one) and “cardiac”. And then there’s poor ol’ George Hayes who died on 24 Dec 1874. His cause of death is listed as: “Accident (barrel of beer fell on him)”. The Litany St cemetery, Cromwell’s first cemetery. Lisa Herbert regularly wanders through cemeteries. She’s the author of The Bottom Drawer Book: an after death action plan, an amusing and informative workbook for those who want to have a say in their funeral. Your ideas, funeral plans, and your life’s reflections will sit quietly in its pages until they’re needed. The second edition is currently available in Australia for $18.95 delivered. Purchase here. The historic cemeteries of Akaroa on New Zealand’s South Island. Catholics to the left, Dissenters to the right. The sign says Roman Catholics to the left, dissenters to the right. While religious segregation in life receives much attention in the public domain these days, segregation in death doesn’t. I stumbled across this sign while walking through the historic cemeteries of the small New Zealand town of Akaroa. So, what is a dissenter? In the context of this photo, the dissenters of Akaroa were mainly Presbyterians. While bubbling away for centuries, dissenters began to emerge more prominently in the 17th and 18th centuries. They questioned the role of their religion in light of new findings, that is scientific findings by people such as Isaac Newton. The Oxford Dictionary of the Christian Church states: “In a religious context, those who separate themselves from the communion of the Established Church.” People began separating themselves from churches including the Roman Catholics and the Church of England. It was opened in 1873. A row of trees and a dilapidated post and wire fence separate the dissenters from the Roman Catholics. They, and the nearby Anglican cemetery, are in a great little spot with great views and dense forest. There’s a network of walking tracks that connects the cemeteries to the Garden of Tane, a stunning scenic reserve. The Akaroa Dissenters Cemetery is nestled in pretty native and exotic vegetation, separate to the nearby Catholic and Anglican cemeteries. Graves are laid across the steep slope in an east west orientation and, as usual, reveal tough times for pioneering families. Catherine Bruce died aged 23, her sister Jeannie died aged 21 six years later. They and their father are buried in Akaroa Dissenters Cemetery. The Akaroa Catholic Cemetery sits on the hill overlooking the harbour at Akaroa, on New Zealand’s South Island. The Dissenters Cemetery sits below it. Most graves run across the slope in an east west orientation. Further reading: This note on Protestant Dissent and the Dissenters in English history is drawn in large part from the first chapter of a M.A. thesis by Steven Kreis, “An Uneasy Affair: William Godwin and English Radicalism, 1793-1797,” (University of Missouri-Columbia, 1984), pp.7-14. Lisa Herbert is a journalist and author of The Bottom Drawer Book: an after death action plan. Where did the cemetery at Singapore’s Fort Canning Park go? Does moving headstones move a graveyard? In Singapore, apparently so. While the headstones and monuments at Singapore’s popular tourist spot, wedding and concert venue Fort Canning Park have been moved, the graves themselves remain. But you wouldn’t know they were there and no-one seems too concerned. Sprawling lawns now cover the one-time cemetery, with just a few monuments clumped together in a corner and some headstones incorporated into a wall that runs down the sloping hill. The official line from the authorites is that most of the graveyard’s monuments and headstones were so delapidated they were removed in the mid 1970s. Six hundred people were laid to rest in the cemetery between 1822 and when it closed in 1865. Can’t you tell? Um… Well… No. Sprawling lush lawns and a paved pathway now cover 600 graves at Fort Canning Park , Singapore. 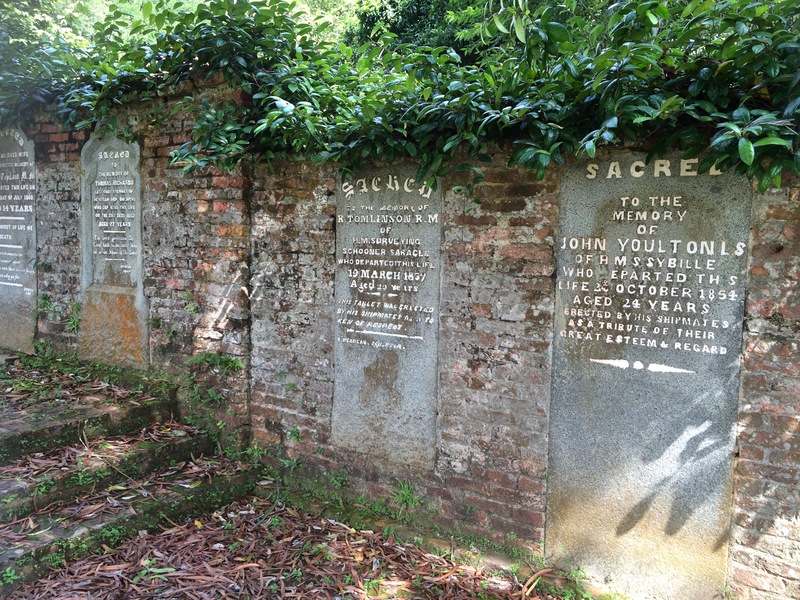 headstones that have been incorporated into a beautiful brick wall reveal the diverse range of people buried at Fort Canning. A third of them were Chinese Christians and languages on some of the reamining tombstones include German, Thai and Dutch. 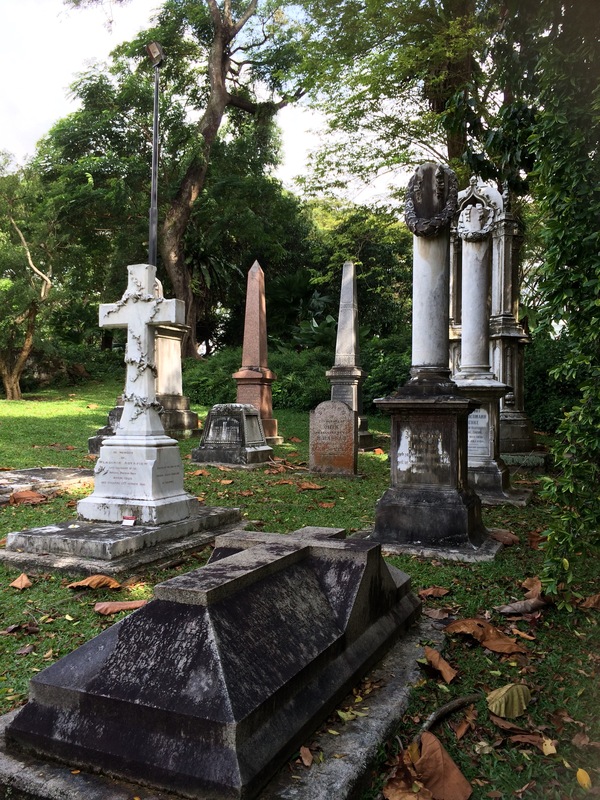 A handful of monuments remain in one corner of the former cemetery at Fort Canning. I can’t help but wonder what Australians would think of a lawn replacing an old cemetery. Do you think there’s a period of time than passes before it’s OK to transform a cemetery into a recreation area? Two of my friends visited cemeteries during their recent overseas Christmas holidays. In the Phillipines, the Hanging Coffins of Sagoda caught Steve’s interest. Nobody really knows the reason these coffins hang from the side of limestone cliffs in Echo Valley within the Mountain Province. There’s speculation that it either gets them closer to heaven/paradise, protects them from animals and floods or even that it saves space so as not to use up valuable agricultural land. It’s thought the local Igorot, the local tribe, have been laying their loved ones to rest this way for 2,000 years. It’s a practice that has been done in China too, for well over 2,000 years. This burial custom still takes place these days, though it’s only some of the elderly who choose this method of burial. Visitors to the area walk through a more conventional cemetery on the hike to the cliffs. The coffins are in a range of sizes, with the small ones said to be filled with bodies that are in the foetal position; the theory being that those people leave the world as they entered it. Hanging next to some of the coffins are wooden chairs. It’s on those chairs the deceased sat as they were prepared for burial. It’s hard to fathom just how those heavy coffins are put in place. Some are also laid in nearby caves. Eventually the coffins disintegrate. People visiting the site are encouraged not to stand under the cliffs, just in case some bits and pieces fall from the cliffs. The graves my friend Charlotte visited on Nusa Lembongan are more conventional but just as peaceful. They’re also an example of the way ancestors are cared for and tradition upheld. The island is south east of Bali and is fast-becoming a popular tourist destination because of its stunning beaches and bays, snorkelling and great natural attractions. Many of the headstones there are shaded by colourful parasols. This is to keep the hot, tropical sun off the dead. Protecting graves from the elements is not uncommon. I have seen graves in Botswana, Africa shaded with iron and cloth covers and decorated covers over Aboriginal graves in some of Australia’s more remote communities. You can always tell a lot about a culture, a town or a community by the way they treat their dead, can’t you?